We are proud to use the latest in skin care technology, known as LSS™ (Life Sustaining System). This cutting-edge technology helps to enhance, improve, and maintain the integrity of skin health. With our focus on the skin and its aging process, we at Skin For Life also take into consideration the elements of sun, lifestyle, and genetics which can often be responsible for aging skin. Skin For Life professional skin care products focus on skin health. The superficial portion of the skin is what everyone wants to improve; however, without enhancing what you don’t see you will never be able to improve what you do see. Whether you have Dry Skin, Troubled & Oily Skin, Combination Skin, or Sensitive Skin, we have the skin care solution to soothe and alleviate your skin’s issues. -Blemish Buster Trio to cleanse, correct, and control troubled skins. -Rejuvenation Skin Care Kit to revolt against dry, dehydrated, mature or aging skin. Fighting against the clock? Keep this Age Defying Duo as your secret weapon. Increase your chances to succeed with a vibrant youthful looking skin. The power of three “A, C, E” will add skin protection to fight your daily struggles. So go ahead and be Bold, Bright, and Beautiful; Your skin is worth it! Worried about your blemished skin? Our Antibac Duo is the one-two punch that will help manage your skin concerns. Minimizing oil and troubled skin is a daily routine when wanting to achieve beautiful clear skin. Don’t make your skin a battle field. Make it easy with incorporating Antibac Duo into your existing skin care routine. Don’t hide under makeup because you have dark spots. Start with a simple 2 step Brightening Duo Solution. Brighten and minimize sun, age, and dark spots without using harsh chemicals. Make your skin care routine painless and get ready for performance results by removing skin stress and reaching your skin success. NewGel+ is specially formulated 100% medical grade silicone gel sheeting proven to reduce, flatten, fade and smooth scars – both old and new. It is self-adhesive and worn directly on the scar. For optimal results, use NewGel+ silicone sheeting whenever possible and NewGel+E ointment whenever the sheeting is not being used to provide 24 hour-a-day coverage. DO NOT USE BOTH PRODUCTS AT THE SAME TIME. Getting NewGel+E gel on NewGel+ sheeting will cause the sheeting to lose all adhesiveness. NewGel+ sheets, strips, and dot products are a soft, flexible, and silicone water product that aid in the prevention, reduction, and management of scars. Our scar management solution not only fades scars, but flattens and softens them as well. Our products are easy to apply and comfortable to wear and offer greater long term durability than other products on the market. 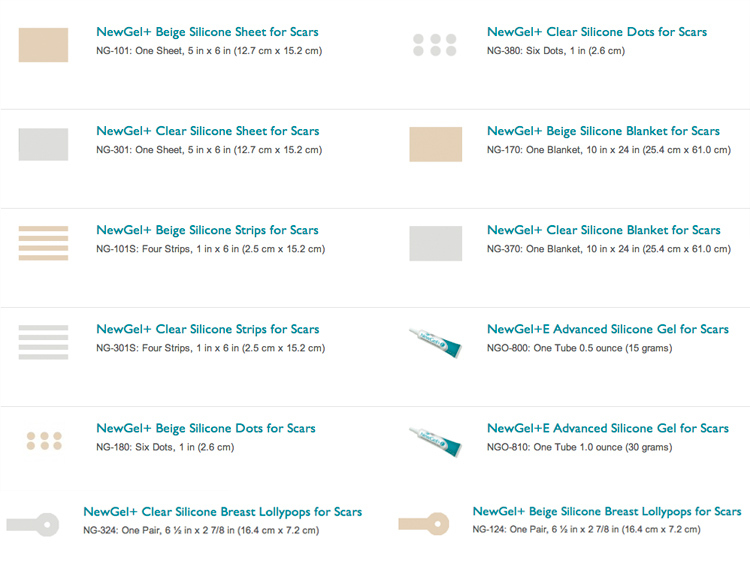 We offer a variety of sizes and shapes of silicone scar sheets in order to best suit your needs, ranging from ear shapes to larger sheets meant for abdomens and extremities. NewGel+ silicone gel sheeting is recognized as the most cost-effective and non-invasive option for scar management. Self-adhesive, reusable, and formulated from medical grade silicone, all of our gel sheets, strips, and dots are available in soft, stretchable beige or clear. Our beige backing is slightly thicker and more durable than clear backing while our clear backing is thinner and more comfortable for the user – both have the same amount of silicone.